One of my favorite memories of our trip was standing on this sheer precipice admiring the mighty Háifoss, in the Icelandic highlands. 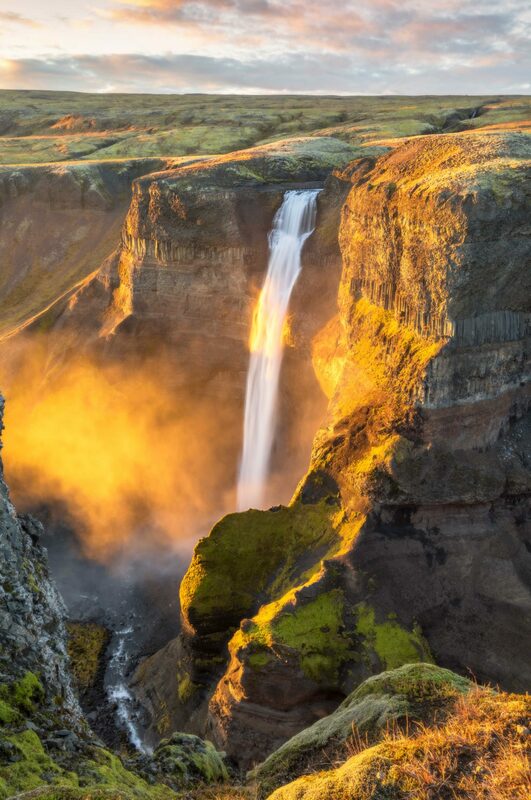 At sunset, the waterfall mist lit up a beautiful golden color. My significant other and I spent thousands of kronor on a rental car, to drive hours from Reykjavik on nothing more than a downloaded Google map on our phone to find this spot. We had hoped to photograph aurora here this particular evening but the clouds rolled in; we fortunately were blessed with a beautiful sunset. This area is so beautiful and remote, at night, there is not a soul or any evidence of human habitation to be found. Breathtaking! What more motivation could one ask for than hoping to shoot a scene like this?